Disabled seniors have fewer choices in terms of games, but they can still have fun on Halloween. Here are games that physically challenged seniors will find thrilling to play with their Rhode Island caregivers. 1. Even if your loved one has a visual or hearing impairment, he or she can play this game. First, create a mystery box. Then fill it with items to identify using the sense of touch. Here’s how to organize the activity. 2. Locate a large cereal, tissue, or shoebox. Cut a hole in the box that’s big enough for a hand but doesn’t make the contents visible. If you wish, decorate your box with Halloween-themed paper. 3. As you place each item in the mystery box, keep a running list of your objects. 4. If you want to add an element of drama, softly play eerie sounds in the background. 5. Each player takes a turn identifying a particular item. You announce the object they should fish from the box. The person who correctly finds the most articles wins a prize. Halloween Bingo is similar to the regular version except the game boards have seasonal pictures. Designate one individual as the caller. This person selects and announces the images for players to find on their cards. When a player can match the called image on their game board, they mark the space with an object. For Halloween, consider using candy corn or pumpkin Mellowcremes as markers. The winner is the first person to cover five squares in a row, either horizontally, vertically, or diagonally. Usually you play charades by wordlessly describing the title of a book, movie, song, saying, or famous person. The first player to guess the title wins. Adapt charades for Halloween with seasonal topics. Here’s how to play. 1. Write up subjects to pantomime on slips of paper. Fold the papers in fourths and place them in a bowl. 2. Select a topic from the bowl to act out silently. 3. Indicate the type of subject. For a book, you can pretend to page through a book. To announce a song, imitate singing. For a film, simulate cranking an old movie camera. 4. To indicate the number of words, hold up your corresponding fingers. Before acting out the first word, hold up one finger. Then, announce the second word with two fingers, and so on. 5. To represent a rhyming word, tug on your ear for “sounds like”. 6. When a person guesses a word correctly, confirm the answer by touching your index finger to your nose, for “You guessed it, right on the nose!” The first person to figure out the phrase wins a prize. 1. Purchase five plastic pumpkins and a set of foam balls from a discount store, such as Walmart or Target. 2. Arrange the buckets at varying distances from a throw line. You might position them at four, five, six, eight, and 10 feet. 3. Assign point values to each pumpkin, with points increasing by distance. For example, you can issue point values of two, four, six, eight, and 10, respectively. 4. Give each player a chance to pitch five balls into the pumpkins of their choice. Then tally their points. The senior with the most points wins a prize. 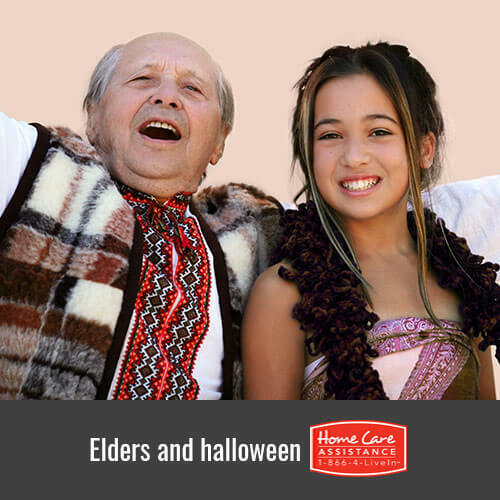 For more ideas to entertain your senior loved one this Halloween, contact Home Care Assistance at (401) 284-0979. We provide comprehensive live-in and hourly home care Rhode Island families can rely on to help seniors age in place despite injury or illness. Talk to a friendly Care Manager today to set up a free consultation and customize a care plan for your loved one.